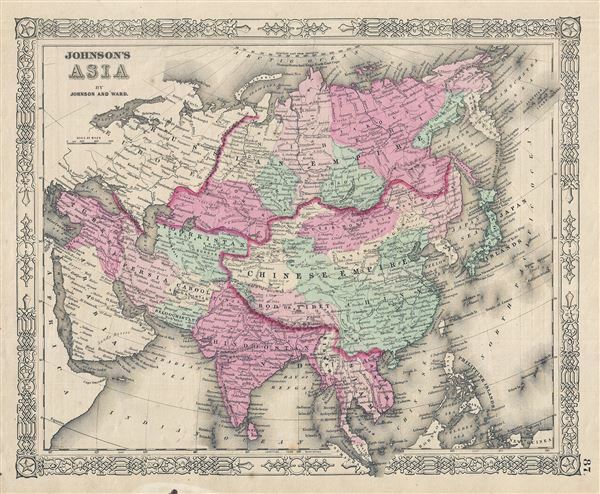 A very nice example of Johnson and Ward's 1863 map of Asia. Covers from the Arabian Peninsula and Turkey eastward as far as Kamchatka, Japan, the Philippines and New Guinea. Shows the Empires of Hindoostan (India), China (includes Tibet), Toorkistan, Persia (Iran), Cabool, Beloochistan (Afghanistan), Birma (Burma), Siam (Thailand), Anam (Vietnam), Malaysia, Japan, etc. Various towns, cities, rivers and several other topographical features are noted with relief shown by hachure. This map features the fretwork style border common to Johnson's atlas work from 1863 to 1869. Published by Johnson and Ward as plate no. 87 in the scarce 1863 edition of Johnson's Family Atlas.